When heart defects develop before a baby is born, it’s called congenital heart disease. It can affect the heart’s walls, valves and blood vessels. 50 years ago, children born with heart defects were likely to die before reaching their first birthday. Today, 8 out of 10 survive. Most will need lifelong care. That’s why we set up a unit that cares for congenital heart patients throughout their lives. Our Congenital & Paediatrics unit cares for congenital heart patients from birth to old age. Hours after birth, we perform complex operations to save the lives of premature babies. We correct heart defects in infants and children. Working alongside consultants, you can find teachers and play therapists supporting children, while psychologists support their families. And, as the first generation of congenital heart patients reaches adulthood, we’re studying the ongoing problems they face, and providing the complex care they need throughout their lives. Ours is the only private unit that joins up care in this way. Some babies are born with only one working ventricle. To save their lives, they need open heart surgery. The operation is called the Norwood procedure. It’s a highly complex reconstruction of the aortic arch. Because the patients are so young, and their hearts so small, the surgeons deal in millimetres. After the operation, patients stay in intensive care for up to 72 hours with their chests open. They then need weeks of support from paediatric anaesthetists, physiotherapists and dieticians until they can breathe and feed by themselves. Patients with a dilated aorta — because of Marfan’s syndrome, for instance — face open heart surgery and a lifetime of anticoagulant medication. 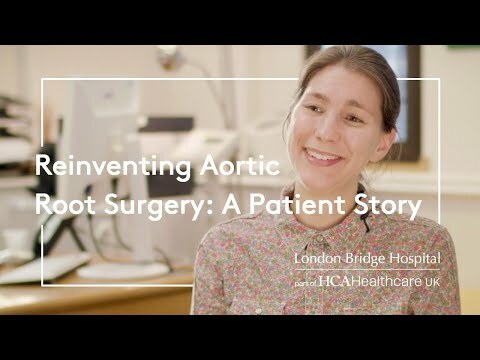 We’re one of the only centres in the world performing PEARS procedures — personalised external aortic root support. We’re treating patients as young as 12. A CT scan is taken, and used first to construct a 3D aortic root model, and then a bespoke aortic root support. Our surgeons place this around the aortic root, to stop it dilating any further. It dramatically reduces the likelihood of further surgery and removes the need for anticoagulant medication. This procedure is simple and elegant and it’s going to change my life. Patients who’ve had congenital heart defects corrected in childhood often develop related problems in adulthood. These might include rhythm disorders, valve disease, heart muscle failure, or all three at once. This level of complexity requires the best in every discipline to work together — from intensive care and anaesthetics, to cardiology and cardiac surgery. Our hospitals are internationally recognised. Our cardiac department brings together these different sites, our consultants, nurses, teams and technology. It’s all these elements combined that allow us to deliver outstanding care. As well as treating our patients, we support them in other ways too — from helping them get mortgages and travel insurance, to advising then on what sporting activities are appropriate for them. We're happy to help you make an appointment with one of our experienced cardiologist or cardiac consultants.